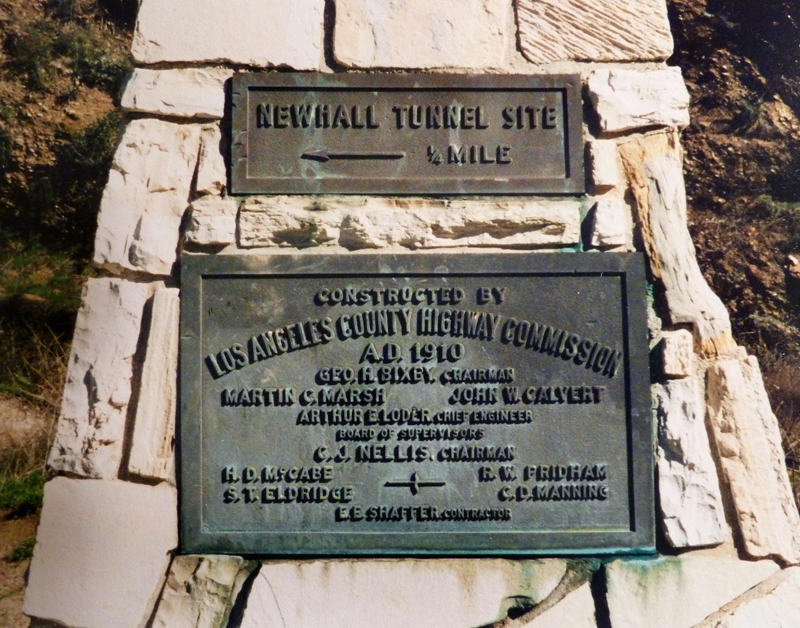 The markers for the Newhall (Auto) Tunnel might be even more historic than the tunnel they point to. At least the tunnel is still buried under Sierra Highway; the bronze plaques are long gone. Markers for the tunnel (1910-1938) and nearby Beale's Cut have been placed and replaced on the east side of Sierra Highway, just south of the cut, a few times over the years, only to get stolen almost immediately. As the age of the automobile descended on the Newhall Pass, Beale's Cut proved to be too difficult a climb for this new mode of transportation. Therefore in 1910, the 435-foot-long Newhall Auto Tunnel was constructed a quarter-mile to the northwest of Beale's Cut. Just 17½ feet in width, the tunnel was quite narrow, making it difficult for two-way traffic to pass through. By 1938, with increasing auto and truck traffic, the California Division of Highways determined it needed to be replaced. In July of that year, the mountain above the tunnel was blasted away, and a four-lane road was built above the level of the old tunnel. It was first known as Highway 6, then Highway 14, and finally as the present-day Sierra Highway. The cutout of the mountain where the tunnel was located can still be seen today on Sierra Highway at the crest of the Newhall Pass. TS0101: 19200 dpi jpeg from digital image by Todd Spiegelberg.